Sunday 26th August has been designated by the Heritage Council of Ireland as Water Heritage Day and Drogheda Museum Millmount in partnership with the Drogheda Port Company is delighted to announce that a new exhibition will be opened in the museum on that day. The material for the exhibition has been selected from the very extensive and hugely important archive of the Port Company, which covers the development of the port and its immense contribution to the economic development of Drogheda and its hinterland. It is intended that this exhibition will be just the first phase of a joint project between the museum and the Port Company to preserve and catalogue the archive and eventually to make it accessible to researchers and the general public. In that way the major contribution to the wellbeing of the town of Drogheda Port and the people who worked there will be better recognised and appreciated. The exhibition will include fascinating information about the origins of the Port Company, the development of various quays and piers in the dockland area and the establishment of The People’s Park. Find out why it was called “Donor’s Green”! 2018 has been designated by the European Commission as the European Year of Cultural Heritage. The initiative is designed to be truly European, with activities taking place at all levels: European, national, regional and local. The Year aims to involve all citizens in events that help to promote a sense of belonging to a common European space. This new exhibition is part of Drogheda Museum Millmount’s contribution to the Year of European Cultural Heritage and fits the objectives of the Year very appropriately. 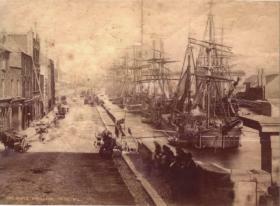 The Drogheda Port was one of the major links between Ireland and Europe through the ages, as is evidenced by many of the artefacts on display in the museum. While Drogheda Museum Millmount and the Port Company look forward to an ongoing cooperation to bring this heritage to the public, this new exhibition in the museum will provide an intriguing and informative kick start to this exciting project. The exhibition will be formally launched in Drogheda Museum Millmount at 5 p.m. on Sunday, 26th August and will remain on display in the museum for some time afterwards. All are welcome to attend the launch and to view the very informative display.